Pros: Further personalizing creatures for hands whom enjoy a certain level of intimacy with their minions. After brainstorming a lot of ideas over the last couple weeks, I've determined I have a lot of them. So many, in fact, that I'm fearful of just diarrheaing them out and flooding the forum. So, before I start presenting them as best I can while attempting to insure that is not the case, I thought I would suggest another simple interface related one that would be, while not utterly grand and game changing, a small, simple and ultimately nice alteration that I think would make the game better while I organize my other ideas a little better before presentation. I'm still not exactly sure how to present all of them without flooding and having them all just sort of become little more than white noise. Adding some way of saving the creatures name to be rooted in the save file, so that when one comes back, they have all the same creatures, with all the same names. Unlike the current system, while just randomizes the names during every load. This is something that bugs the crap out of me. And, if I recall, dungeon keeper 2 had the same problem. The names of the units don't get saved along with all the rest of the information in the save file. Meaning that, when you take a break and save, and load the game, your creatures all have different names than they did during your last session. It might seem like a small detail, and indeed, I could not deny one who stated it so. But it's an important minor detail, I feel. Just another little thing that connects one with the denizens under their command. Allow me to give you an example of what brought this to my attention. I was playing Dwelvers, not to long ago, it was my first game I had ever managed to reach the Cyclotaur maze, and, after training my creatures up as high as I could, and ensuring they were positioned correctly, I commanded my imps to dig and brought forth the wrath of the maze. It was a grueling battle, many of my minions were slayn. The battle lasted so long, that most of my creatures had wiped and I was fighting with fresh faced level ones against the lvl 4 beasts that occupied the hold. But there was a shining light. For I had claimed some territory, and, thus, I was getting some Cyclotaurs of my own, and my was I elated when the first of these creatures entered the fray under my banner. His name, Horhand. Or at least, he was the first I so recognized and remembered, as he charged into the fray with my fledgling orcs and impanzees, as well as the rag tag remains of my mid level forces. It was a fierce affair, however, when all was said and done, I had a legion of Cyclotaur of my own, and they tables soon turned more and more to my favor, until none of the enemy cows were left standing, insuring my victory, and making my legion a rather unstoppable force. Being the Benevolent Overlord I am, I rewarded Horhand for his efforts, crowning him my champion. And what might that mean? Why, that's simple. He was the creature I would possess before every battle. He was the creature I ensured was fitted with the best shield, and the best sword I had available. He was the minion I waited on before engaging in combat. It's rather silly, admittedly, but, none the less. I felt an attachment to this unit. As I did for many of my other units. Weather it be Ethan the imp managing my Trade route. Or one of the other multitudes of units I can't remember off hand lest I saw there names before me. But still, you are beginning to see a picture of me, the player, and how I relate to my units. So, you can imagine my dismay after I saved the game and returned, only to find my champion was no where to be found. At first, I assumed he had died somehow, and I cursed under my breath a slight bit. I didn't feel an overwhelming sense of loss, mind you, I am an evil dungeon master after all. Have to keep up appearances. But I was a little disappointed. But, then I found Davdak, and I named him my new champion, and I gave him my one and only Knight's Hammer to separate him from his comrades. Granted, he wasn't Horhand, and I only choose him because he had the word 'Dav' in his name, which is a gamer name I use in some way for almost everything. So, now I had a new champion, and we had more, if not less enthralling, adventures and conquests together. Though, now with 10 Cyclotaurs who were, along with all my other minions, all armed to the teeth, the map posed very little challenge after that. Knights were overwhelmed and destroyed like like orcs on a rogue. And one after the other, the portals of men fell. But, again, another time to save, and another time to load later. And, imagine my surprise when now Davdak was gone, however, there was still one cyclotaur wielding his hammer, and of a different name... But not only that, but Horhand, my first unit I have believed slain, was now in my legion once more! I have given this story telling to attempt to paint a picture of why I believe this minor feature should be given some attention. I know not everyone attaches themselves to their units. But, even so, why bother even giving them a name to personalize them at all if it doesn't carry over from save to save? So please, take heed, dear dwelver devs, consider giving this feature some attention in the future. If not for me. 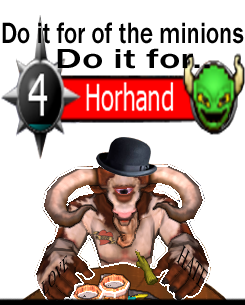 For Horhand. Requires: The first idea mentioned in this post to be implemented. If the keeping of creatures names between saves is included, it would open the door for this second, optional suggestion, which is, the allowance of Hands to rename their minions to anything they desire. 'Why is this important? ', you might ask. Well, if you cannot see the appeal automatically, allow me to point something out. I know several people who play games such as Dwarf Fortress who name units after people they know, allowing that much a personal touch to those creatures. I know of, on more than one occasion, myself having a dwarf named after me in such a game. Then, whenever we chat, they can update on what my dwarf is doing. Saying something to the effect of 'You're now my master smithy', down to the enviable 'you were eaten by a carp'. I myself renamed every unit in my X-com squad after my room mates and friends, which allowed me to fill them in on what each of their units where doing. Such as saying "Hey Bob.. you just shot a alien in the face! Boom!" And sure, it's sometimes a little dorky, but it's still a grand bit of fun, and well, I never dared loose a unit in combat because of it.. Most importantly though, the question isn't really why, but rather.. why not? Perhaps it's not the most import feature to be added, nor is it necessarily one that must be urged to be done right this very second. But I do believe this deserves consideration, and to be placed on the 'to do' list for a time when it might be convenient to be implemented. True, I could understand some players might prefer some level of detachment from their minions, so renaming might not be everyone's cup of tea. But, then, some of us do like it, and it's not something that would be required for those that do not wish to utilize it. As for saved names, I can tell you with certainty that they are not saved. In fact, I reloaded a save of mine 5 times to find another Horhand, which I used to take the silly screen above. Each time you load, the creatures names are randomized, it's true, the pool of names is small enough to have repeat business, in fact, during those four loads to get Horhand, I encountered DavDak and Davgold several times in my Cyclotaur ranks, but never in the same part of the roster. I know the feeling, but since a lot of work has been going into the next update in a part; I guess the focus is to get something to push forward. I myself am not fond of the idea, just not my cup of tea. More enough reason I didn't reply or say anything. I read a lot of the things here, some I am partial to and some not so much. I can understand that some would like this feature, as it makes sense to a degree. I have done this in other games, but this one I didn't see a reason too, especially when there are so many units all over the place. But that is me and the way I go about playing. I think a lot of people are in the same mode as you, Tamorr, but me, personally, I'd rather still hear their thoughts. I mean, heck, I just got two people who aren't keen on this idea, and I'm actually happy to get the feedback. Well, it's not really feedback, so much as putting thoughts into the common ring for onlookers to behold; but still, you get my meaning. It's a good thing to throw thoughts out and see if they stick. It's also good to dispute things that you don't think will, or you just aren't keen on. Well, I dunno how everyone feels about that, but I sure don't mind it. Even a disagreement can allow an idea to grow. Something like that really is something that doesn't bother me in the very least; I guess due to my playstyle. I've not noticed probably also due to the way I have played. Never said I was not in favor, just would be something I might not end up using. To me it is an interesting feature, and would serve better for those that would use it obviously. I like options. Hmm, I see the advantages of this idea, especially the second idea (in Pokémon games naming your monster provides more points of happiness that are given with specific conditions), the first I think is about game performance, but let Rasmus think about this. Added to Ideas & Game Features list. Yeah, I know what ya mean by 'crickets', hell I haven't had much time to squeeze Dwelvers into my busy schedule lately. I think most of the chatter is going through Steam, and quite frankly, I hate the format Steam uses for forums on games. Getting back to your idea, I think this would make a lot of sense that is when the game is more optimized to the point where the possibility of losing creatures due to some production chain failure because your excavations have gotten too ambitious. This is what I run into sometimes so I really don't have much investment in my creatures because I plan on them dying off when this happens as it has started to be the norm in my larger dungeons. I think the Piggeh in the kitchen is the root cause, but all that being said, yes I would like to have control over naming my characters at some point. i would love this feature in the game i had a cyclotaur hero myself named Quonan he also got very simalar treatment as horhand. i also had my favrite imp an piggeh the imp was named Nils he was always the first one into a new area and i found it amazing that he always got out alive and the piggeh was my master chief she waddled aroud with a giant axe in his hand her name was Granny i loaded agian ony to find none of them were there not even the invincable Nils. Yes, I still think this is a good feature. Might even be best kept in some sort of seperate xml file for the game to referance. Then, make it so if you really want to rename creatures, people would need to alter there Xml file for whatever save. It would be one of those things that people would do if they really wanted to. I sure as hell would. Awesome sauce, I'd love for that. But no rush. Horhand can wait a little while while you hammer out swimming and the surface world. That's pretty tight. Clean, out of the way, but in a place that they might catch it when they are tooling around with stuff. Just a little treasure for players to find as they play. Thumbs up to you sir.